I love watching baking competitions with my hubby. We watch Cupcake Wars and Cake Wars, and even draw inspiration from them. We learned about Red Velvet cake while watching one of these shows, and it just so happened that is what we chose for our wedding cake in July. With wedding season passed, the next big focus is Halloween. One of my favorite holidays too. What other day can kids and adults be anything they want for the whole day? You want to be a spider, be one. Want to be a zombie, be one! I will be Juliet this year. Romeo will be at work. I just love the imaginative spirit of Halloween. So I'm super stoked about this new show coming to Food Network. 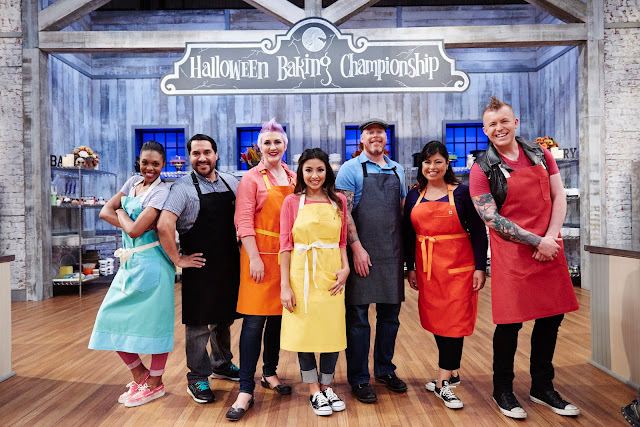 Hosted by Richard Blais, this championship is full of tricks and treats. It's only four episodes though. Seven of the top bakers will be competing to create some of Halloween's spookiest, eeriest, and creepiest creepy crawly confections you have seen. Among these cool creations will be spider cupcakes, mummy macarons and cheesecake coffins, which sound to die for. In order to stay in the competition, these top bakers must prove their baking skills and creatively impress the judges. Then there will be a lone winner crowned the Halloween Baking Champion, and take home the $25,000 grand prize. It all begins on Food Network, Monday, October 5th at 9pm EST. Be there, or be scared! BWHAHAHAHA! Looks like another fun show to watch on the Food Network!